I was introduced to this delicious combination a few months ago at a Persian gathering. It’s so incredibly simple to make and the taste is just out of this world good. I have found that my favorite way to make this dish is by simply adding the two main ingredients together and nothing else. 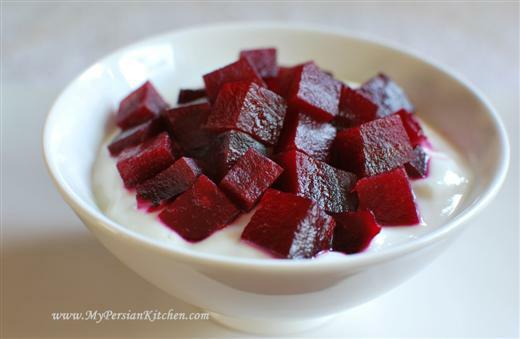 I love the way the sourness of Persian yogurt is combined with the sweetness of the beets. You can use any type of yogurt you like. I used Persian yogurt, but I have no doubts Greek yogurt would also be a great substitute. I personally like to roast my beets. I highly recommend buying fresh beets and either roasting them or steaming them yourself instead of using the ones out of a can. It really does make a huge difference taste wise. Rub beets with a bit of olive oil. Roast beets in 375° oven for one hour or until a fork goes through each beet. Let cool down. Remove skin from each beet and dice. It’s up to you how big or small you want to make the beets. Either mix beets with yogurt or just pour over yogurt. Rub beets with a bit of olive oil. 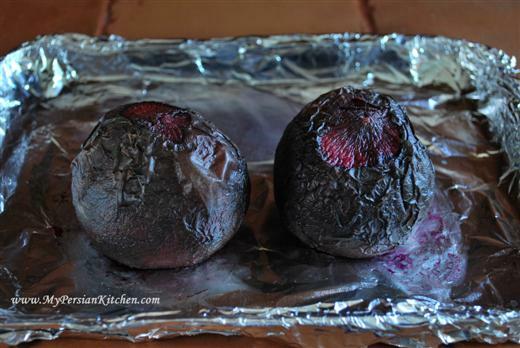 Roast beets in 375° oven for one hour or until a fork goes through each beet. Let cool down. 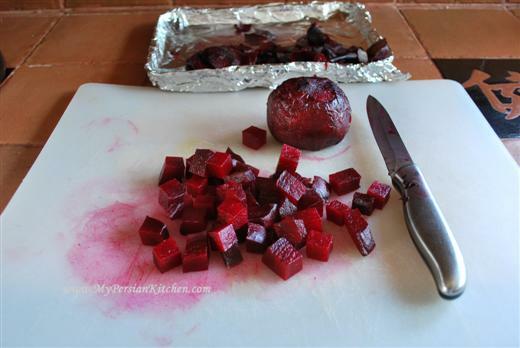 Remove skin from each beet and dice. It’s up to you how big or small you want to make the beets. Either mix with yogurt or just pour over yogurt. My wife loves beets, I will have to make this for her. Lovely cooling dish for summer. Gorgeous color, too! Sometimes simpler is better. Two ingredients that complement each other perfectly: taste, texture and color! Great idea, I will definitely be making this. Looking forward to meeting you on Sunday at the Cabrillo Beach. YAY for Romee and her terrific blog, can you believe she walked every single block? That is amazing! Lori Lynn, I am seriously impressed with her! Looking forward to meeting you too!! Lovely and simple, sounds amazing!